Imagine you are working at a company that is switching from a monolithic architecture to a microservices architecture. The application your are working on is a big client facing web application. You have recently identified a couple of self-contained features and created microservices to provide each functionality. Your former monolith has been carved down to bare essentials for providing the user interface, which is your public facing web frontend. This microservice only has one functionality which is providing the user interface. It can be scaled and deployed separate from the other backend services. You are happy with the transition: Individual services can fit in your head, multiple teams can work on different applications, and you are speaking on conferences on your experiences with the transition. However you’re not quite there yet: The frontend is still a monolith that spans the different backends. This means on the frontend you still have some of the same problems you had before switching to microservices. 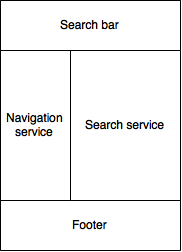 The image below shows a simplification of the current architecture. Backend teams can’t deliver business value without the frontend being updated since an API without a user interface doesn’t do much. More backend teams means more new features, and therefore more pressure is put on the frontend team(s) to integrate new features. To compensate for this it is possible to make the frontend team bigger or have multiple teams working on the same project. Because the frontend still has to be deployed in one go, teams cannot work independently. Changes have to be integrated in the same project and the whole project needs to be tested since a change can break other features. Another option is to have the backend teams integrate their new features with the frontend and submitting a pull request. This helps in dividing the work, but to do this effectively a lot of knowledge has to be shared across the teams to get the code consistent and on the same quality level. This would basically mean that the teams are not working independently. With a monolithic frontend you never get the flexibility to scale across teams as promised by microservices. Besides not being able to scale, there is also the classical overhead of a separate backend and frontend team. Each time there is a breaking change in the API of one of the services, the frontend has to be updated. Especially when a feature is added to a service, the frontend has to be updated to ensure your customers can even use the feature. If you have a frontend small enough it can be maintained by a team which is also responsible for one or more services which are coupled to the frontend. This means that there is no overhead in cross team communication. But because the frontend and the backend can not be worked on independently, you are not really doing microservices. For an application which is small enough to be maintained by a single team it is probably a good idea not to do microservices. If you do have multiple teams working on your platform, but you were to have multiple smaller frontend applications there would have been no problem. 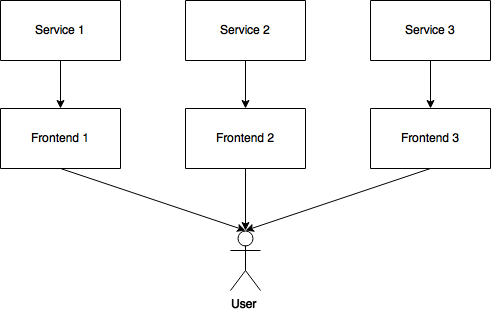 Each frontend would act as the interface to one or more services. Each of these services will have their own persistence layer. This is known as vertical decomposition. See the image below. When splitting up your application you have to make sure you are making the right split, which is the same as for the backend services. First you have to recognize bounded contexts in which your domain can be split. A bounded context is a partition of the domain model with a clear boundary. Within the bounded context there is high coupling and between different bounded contexts there is low coupling. These bounded contexts will be mapped to micro services within your application. This way the communication between services is also limited. In other words you limit your API surface. This in turn will limit the need to make changes in the API and ensure truly separately operating teams. Often you are unable to separate your web application into multiple entirely separate applications. A consistent look and feel has to be maintained and the application should behave as single application. However the application and the development team are big enough to justify a microservices architecture. Examples of such big client facing applications can be found in online retail, news, social networks or other online platforms. Although a total split of your application might not be possible, it might be possible to have multiple teams working on separate parts of the frontend as if they were entirely separate applications. Instead of splitting your web app entirely you are splitting it up in components, which can be maintained separately. This way you are doing a form of vertical decomposition while you still have a single consistent web application. To achieve this you have a couple of options. You can share code to make sure that the look and feel of the different frontends is consistent. However then you risk coupling services via the common code. This could even result in not being able to deploy and release separately. It will also require some coordination regarding the shared code. Therefore when you are going to share code it is generally a good a idea to think about the API that it’s going to provide. Calling your shared library “common”, for example, is generally a bad idea. The name suggests developers should put any code which can be shared by some other service in the library. Common is not a functional term, but a technical term. This means that the library doesn’t focus on providing a specific functionality. This will result in an API without a specific goal, which will be subject to change often. This is especially bad for microservices when multiple teams have to migrate to the new version when the API has been broken. Although sharing code between microservices has disadvantages, generally all microservices will share code by using open source libraries. Because this code is always used by a lot of projects, special care is given to not breaking compatibility. When you’re going to share code it is a good idea to uphold your shared code to the same standards. When your library is not specific to your business, you might as well release it publicly to encourage you think twice about breaking the API or putting business specific logic in the library. It is possible to compose your frontend out of different components. Each of these components could be maintained by a separate team and deployed independent of each other. Again it is important to split along bounded contexts to limit the API surface between the components. The image below shows an example of such a composite frontend. Admittedly this is an idea we already saw in portlets during the SOA age. 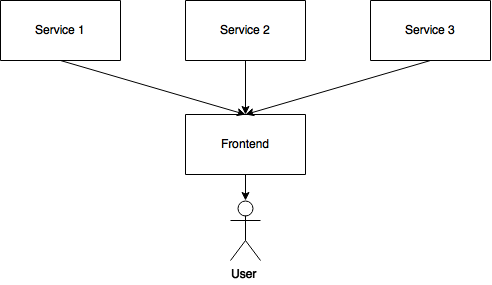 However, in a microservices architecture you want the frontend components to be able to deploy fully independently and you want to make sure you do a clean separation which ensures there is no or only limited two way communication needed between the components. It is possible to integrate during development, deployment or at runtime. At each of these integration stages there are different tradeoffs between flexibility and consistency. If you want to have separate deployment pipelines for your components, you want to have a more flexible approach like runtime integration. If it is more likely different versions of components might break functionality, you need more consistency. You would get this at development time integration. Integration at deployment time could give you the same flexibility as runtime integration, if you are able to integrate different versions of components on different environments of your build pipeline. However this would mean creating a different deployment artifact for each environment. Combining multiple components via shared libraries into a single frontend is an example of development time integration. However it doesn’t give you much flexibility in regards of separate deployment. It is still a classical integration technique. But since software architecture should never be a goal, but a means to an end, it can be the best solution for the problem you are trying to solve. Once you have you have your composite frontend up and running you can start to think about the next step: optimization. Having separate components from different sources means that many resources have to be retrieved by the client. Since retrieving multiple resources takes longer than retrieving a single resource, you want to combine resources. Again this can be done at development time or at runtime depending on the integration techniques you chose decomposing your frontend. When transitioning an application to a microservices architecture you will run into issues if you keep the frontend a monolith. The goal is to achieve good vertical decomposition. What goes for the backend services goes for the frontend as well: Split into bounded contexts to limit the API surface between components, and use integration techniques that avoid coupling. When you are working on single big frontend it might be difficult to make this decomposition, but when you want to deliver faster by using multiple teams working on a microservices architecture, you cannot exclude the frontend from decomposition. Sam Newman – From Macro to Micro: How Big Should Your Services Be? Checkout this project https://github.com/lsm/micromono . Many ideas are similar with your post. You might want to take a look at http://scs-architecture.org – pretty much exactly the same ideas, and always looking for collaborators.